Borrowing the title from Atom Egoyanâ’s absurdist comedy Family Viewing, Linda Gallagher and Ted Partin present an exhibition of drawings, paintings, and photographs. Gallagher and Partin have been working side by side for over a decade, engaged in an unspoken collaboration resulting in an unexpected celebration of the human form, memory, and provocation. Simultaneously seductive and mischievous, the imagery, color and surfaces in the works play with ideas of beauty and desire alongside different viewpoints that build towards notions of identity that are as sincere as they are performative. The artists invite the viewer into a melodrama that is home to their shared psyche. Linda Gallagher is an artist who through painting and drawing seeks to navigate the worlds of both personal and publicly shared imagery. Investigating forms as disparate yet simultaneously connected as sexualized figures, donuts, and imagery from the world of fashion, she interweaves humorous and emotionally laced vignettes onto expansive and lushly painted canvases on both large as well as intimate scales. Her paintings are analogous to a computer screen displaying several open windows, and are in many ways, a visual manifestation of the contemporary brain: absurdist, frenzied, and perpetually multitasking. Linda Gallagher holds a MFA from Yale University and a BFA from Tyler School of Art, Temple University. 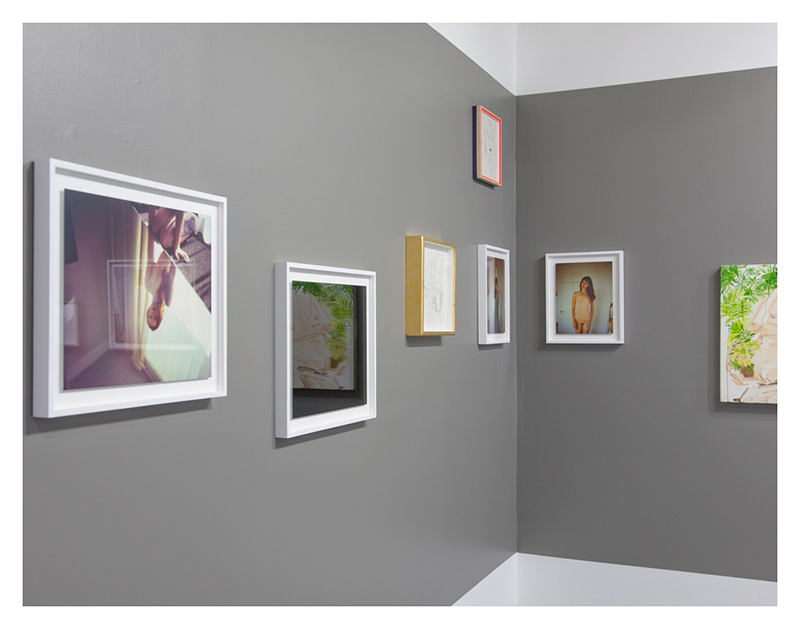 Her work has been exhibited at various galleries in the US, with a recent solo show in the fall of 2015 at Junior Projects, in New York. Her work has been featured in publications such as NY Art Beat, Two Coats of Paint, and Art Fag City. Since 2003 Ted Partin has been making photographs of both strangers and friends with an 8×10 view camera. His work examines how people live their lives, exploring how both the artist and subject interact to produce a representation of that life. The pictures poetically describe an essential part of the mystery of a global tribe, seeking its idealism, beauty, and all the complex intimacies that might render a sense of hope. The unique quality of his dark prints literally describes women that are lost in the shadows; women that are part of a generation that do not know what the future holds for them. As the viewer looks the images reveal themselves as bright and silvery apparitions. The nature of the photograph changes with the movements of the viewer in a dramatic fashion. These pictures are coupled with color prints of women typically photographed naked, fully exposing themselves while standing up to the scrutiny of the 8×10 camera. Ted Partin (New York, 1977) received a B.A. from Fordham College at Lincoln Center in 2000, and a M.F.A. from the Yale School of Art in 2004. His work has been exhibited in New York, San Francisco, Madrid, Paris, Dusseldorf, and Tokyo. In 2005 he was selected to participate in ReGeneration: 50 Photographers of Tomorrow, an exhibit at the Musee de l’Eysee, Lausanne, Switzerland. In 2010 he had his first solo museum exhibition, Eyes Look Through You, at the Kunstmuseen Krefeld Museum Haus Esters in Krefeld, Germany. His work is held in the collections of the Yale University Art Gallery and the Fondation de Cartier Pour le Art de Contemporain. Partin was appointed lecturer in photography at the Yale School of Art in 2016.